Intubation by direct laryngoscopy depends on using the laryngoscope blade to give you a clear field of view of the larynx by shifting the tongue and other pharyngeal structures out of the way. As you might imagine, the patient’s anatomy, pathology, or position can sometimes make this visualization difficult. Laryngoscopy blades come in different shapes to help manage these various situations. 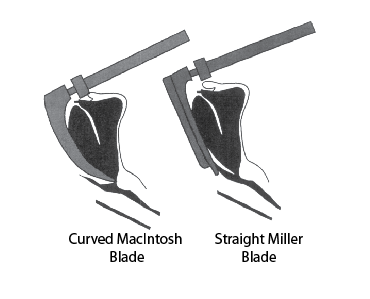 My padawan students often struggle with using a straight blade, such as the Miller blade, as opposed to a curved blade, such as the MacIntosh blade. Let’s talk today about how and then when to use a straight blade. 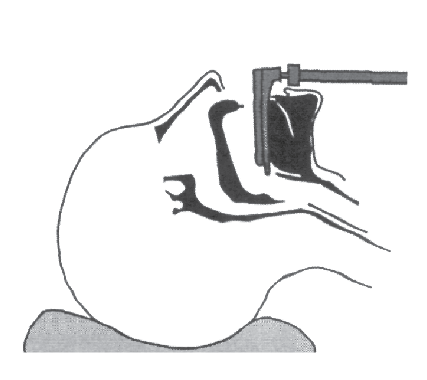 Laryngoscopy using the straight blade showing the larynx. You insert a straight blade to the right side of the mouth and then slide the tongue to the left as you lift. The final position places the blade slightly left of center of the mouth and with the tongue compressed and pushed out of the field of view toward the left. You deliberately place the tip of the straight blade underneath the epiglottis. 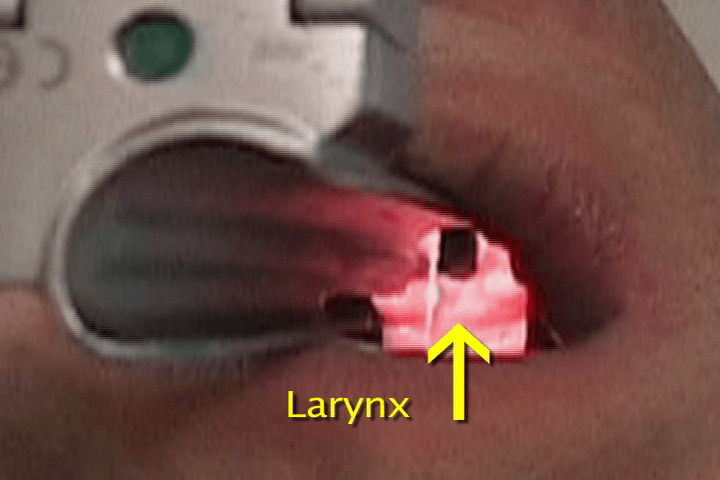 Lifting the straight blade directly lifts the epiglottis upward and allows you to see a clear path into the larynx. Picture the position of the head and neck when a sword swallower swallows the sword. To get that long blade down the esophagus without puncturing anything vital, there must be a fairly straight path from the mouth opening down the throat. This is similar to what you are doing with a straight laryngoscope blade insertion. You must tilt the head back during insertion to make this work. As you might imagine, it might be harder to use a straight blade if the patient can’t tilt their head back. Insert the straight blade into the mouth and advance until the tip is beyond the back of the tongue. 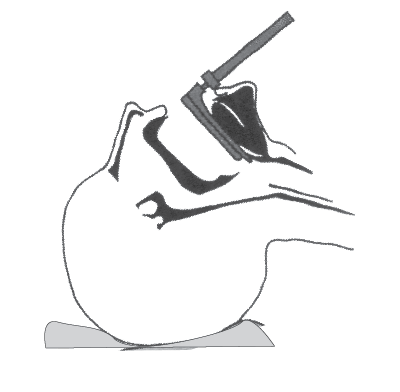 Tilt the head into extension and lift the epiglottis with the tip of the blade. Placement of the straight blade must be more precise because this blade is narrower than a curved blade. If you don’t slide the blade far enough to the left, you often won’t leave yourself enough room to pass the endotracheal tube. The wider curved blade is a bit more forgiving. The tongue will tend to slide underneath the narrow blade if you don’t control it. With loss of control, you not only lose your view, you risk damaging teeth. One predisposition to losing tongue control is failure to lift the jaw enough. The weight of the jaw on the blade pins the tongue into position. Because padawans fear hurting their patients they often don’t lift, allowing the tongue to slide. You must purposefully lift upward and let the weight of the head help you. The other reason to lift is to get the best view of the larynx. Intubation is a fairly physical activity and you may need to suspend the head from the blade in certain situations. However, be very careful to protect the teeth as you lift. Think of that sword swallower position again. Let’s look at the final blade position during the lift and compare it to the curved blade. Difference in final position between straight and curved blades. Curved blade on left places tip in vallecula. Straight blade on right lifts epiglottis directly. That blade angle could bring you perilously close to breaking those front teeth unless you lift the blade upward rather than tilt the blade backward. Don’t use the teeth as a lever. 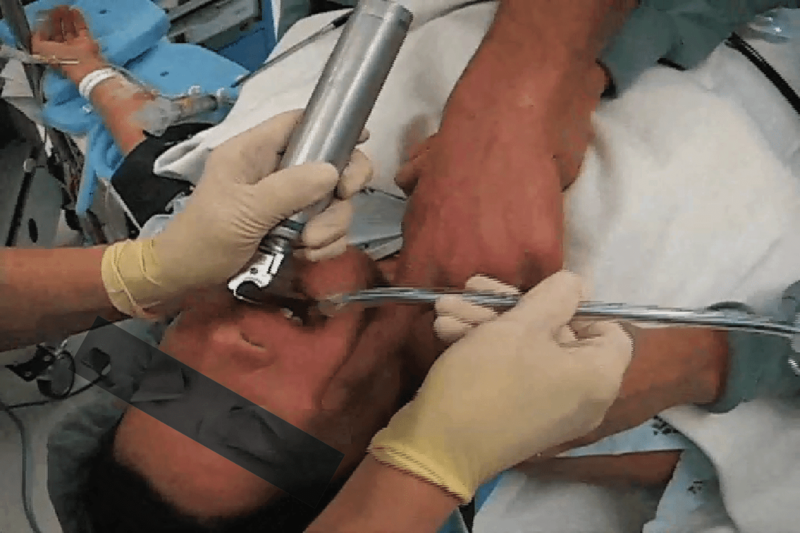 Intubation using the straight blade. Practice with both blades on the easy patients. That way, when a difficult intubation comes along, you control the situation rather than letting the situation control to you. This entry was posted in Intubation and tagged intubation technique, laryngoscopy, Miller blade, straight blade by Christine Whitten. Bookmark the permalink. This really cleared up the technique for me on the 2 types of blades. I’ve been looking for weeks for a proper visualization representation and description. You’re the first one to be able to describe it clearly, so thank you! Would you mind doing same for a Mac blade? Thanks you for asking. I will definitely work on that. Hi! Great topic. The other day, discussing intubation with residents, we could not figure out why is it that on the mach blade you dont lift the epyglotis, and in the straight Miller you do lift it. What is your opinion on that matter? Is there any place for the Miller blade in adult intubation? Thank you! So sorry I’m answering this late, I just found a few messages I hadn’t replied to. i apologize. Curved blades depend on displacing the tongue and soft tissue forward to lift the epiglottis. If you can’t displace the tongue forward, then you won’t lift the epiglottis and you won’t be able to see the larynx. However, you can lift the epiglottis with a curved blade and if the blade happens to grab the epiglottis, then that’s how I lift it. adult patients with short chins, short necks, larynxes higher in the neck, large tongues, obesity (especially with double chins), larynxes fixed from scar, trauma, or mass effect. However, to be able to see the larynx with a straight blade you have to be able to extend the head backward. If your patient can’t tilt his head back, a straight blade will be more difficult. Here a curved blade might be better.